If you are the kind of person that lets your bananas get past their prime like I do, then you definitely need to make this banana cake to use up those extra bananas that are laying around. 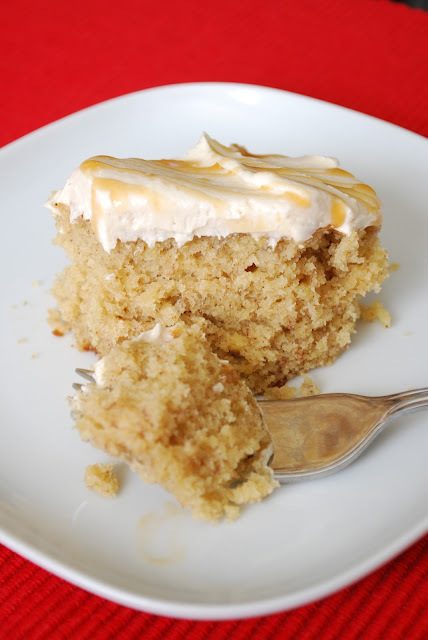 Add the salted caramel buttercream to the cake and it definitely takes it up a couple notches. I don't know what exactly happens when bananas meet caramel, but I will say, it's magical. Place a rack in the center of the oven and preheat the oven to 350. Lightly grease two 9-inch round cake pans or a 13x9 with solid vegetable shortening (Crisco), then dust with flour. Shake out the excess flour and set pan(s) aside. In a large mixing bowl, combine the cake mix, brown sugar, and cinnamon. Add the mashed bananas, water, oil, and eggs. Blend with an electric mixer on low speed for 1 minute. Stop the machine and scrape down the sides of the bowl with a rubber spatula. Increase the mixer speed to medium and beat for 2 minutes more, scraping the sides down again if needed. The batter should look well blended and the bananas should be well pureed. If using 2 round cake pans, divide the batter between the prepared pans. If using 13x9, just pour batter into the prepared dish. Place the pan(s) in the oven. Bake the cake(s) until lightly browned and a toothpick inserted in the center comes out clean, 30-32 minutes. Remove the cake(s) from the oven and let cool. Make sure that the cake(s) are completely cooled before frosting with buttercream. In the bowl of an electric or stand mixer, cream the butter until fluffy. Add the vanilla extract, salt and caramel syrup and blend until well combined. Begin adding the confectioners' sugar, 1 cup at a time, and mix thoroughly after each addition. If you want a thicker frosting, you can gradually add more sugar until you reach the desired consistency. Magical is right! I have been making banana cake with caramel filling for a wedding cake this week and I can't stay away from it! It's super yummy!! I love salted caramel anything! Can't wait to try this. He's made an Oscar nomination, 6 Emmys, six Golden Globes and also three Tony Award nominations. He Additionally founded the Non Profit Alan Alda Center for Communication Science.